Note: the strategy enforced by this game is the simple strategy shown in my Crazy 4 Poker page, which is not 100% optimal. NOTE: If you’re running IE9 and the game keeps crashing, you need to update your Java installation (for it has nothing to do with us but with Microsoft, as they kindly note in their Support Page). Speaking of upgrades, you might want to upgrade your browser to Google Chrome. When you feel like it’s time for a bit of diversity in your poker games or simply want to improve on your Crazy 4 Poker skills, this Java-based variant may come in handy. Like many games here, it is easy, straightforward, and amusing while providing you with an opportunity to play free for up to $25,000. Naturally, you’ve already got acquainted with Crazy 4 Poker fundamentals like rules, strategy, paytables, and betting analysis, you are aware that you’re playing against the dealer, and you are ready to be deployed in the company of our valuable Personal Game Advisor (PGA). For those that meet it for the first time, the PGA is an in-house feature that advises you on best plays to make. It works like a pop-up window in your browser and let you know when your bet might be risky. You can switch it off by clicking on the checkbox “Warn on strategy errors” atop of your game screen. Likewise, you can turn it on at any time during your game. Two paytables are positioned on the right side of the screen. Now, as explained in rules, you have two paytables since in Crazy 4 Poker you make the Queens Up side bet along with your ante bet. Other than that, paytables are quite self-explanatory. On the bottom of the screen is a control strip that lets you set up all parameters of the game and provides for all relevant information. There is a balance field, chips and wager info, a couple of control buttons, and win amount. Antes (and parallel, consequential Super Bonus bets) are made with chips in denominations ranging from $5, $25, $100, and $500 you can choose from the control strip. You’ll notice yellow borders encircling them when selected. You can increase ante in each value by a single click — for $50 bet, click twice on ante field with $25 chips selected. Same goes for Queens Up: select your chips and click on the field in order to make your side bet. The maximum ante and Queens Up is $500. Two buttons — Deal and Clear — are used to direct game moves. Once you’ve set your bet, you proceed by clicking on a Deal button; if you feel like changing your bet denominations, you use Clear button to revert. Once the five cards are dealt, depending on your hand, you’ll see the Fold button and one or three additional buttons offering 1x, 2x or 3x bets. When the hand is played, all buttons will transform into the Repeat and Clear signs temporarily. By pressing Repeat, you reload previous ante/Super Bonus setup in a single click; by pressing Clear, you opt to set a new bet. When the hand is dealt you can see information about your assets right bellow your five-card display, correlating to paytables. 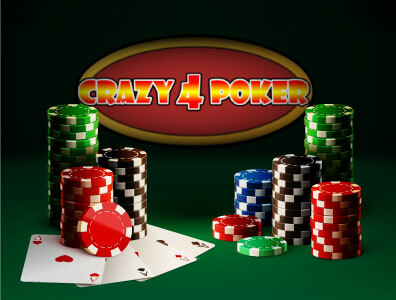 Playing this version of Crazy 4 Poker is quick and funny. The game flows smoothly, all relevant information is visible at any time, and you get an additional visual sense of win when your chips are collected at betting fields. You get the same impression when they’re taken away from you, though. ...works nicely and allows you to use Enter on your keyboard in order to continue with play (thus, you have an option to keep your mouse close to the control strip). As in other games where it’s available, the PGA is not always right. However, it is on point in the majority of instances. After all, like any poker, this variant is also based both on luck and skill. Regardless of the outcome of your play, this online trainer will provide for an exciting time and some valuable lessons to be learned. ...it is a good opportunity to learn robes and get a glimpse of the real play, its atmosphere, and overall vibe of the poker table. Advanced players may find it useful to polish their skills and put some strategies to test before using real money. No matter what your skill level is, use your knowledge responsibly and wisely, and have good luck.